I am betting you have some roast turkey in the fridge or freezer, maybe a pint of gravy too? Well, I have just the recipe for you, courtesy of foodnetwork.com. It is nothing like most traditional turkey leftover recipes. It is a Mexican stew. Posole stew can easily be gluten free. Just use care choosing your chicken broth and your tortilla chips that accompany this savory soup. I have been making it every fall after Thanksgiving and always look forward to a few bowls of it. Spicy, crunchy, tangy; unlike any other soup I make. It is called turkey posole. It can be made with roasted pork and I have done so. I like it far better with roast turkey. I have served this stew to many people and it is always well received and enjoyed, even by my elderly mother. I haven’t made my 2014 batch but it is coming next week to my dinner table. Can’t wait! Cook first six ingredients about 5 min in a large stock pot. Add beer, cook one minute. Add chopped tomatillos and cook 5-6 minutes until softened. Add hominy, thyme and stock and cook 15 minutes. Taste and add salt and pepper. Add lime juice, stir well. I never use cilantro; something I just don’t like, but feel free to add it as the original recipe uses a bunch of it. We ladle the posole into bowls and serve lots of white tortilla chips to crunch over the top of the hot soup. As the soup disappears from my bowl I like to add more chips to keep the crunch going. The more jalapeno pepper you add the hotter it will be. I have tried canned tomatillos and they are not really a good substitute. You can get them fresh (found near the fresh tomatoes) in many stores including Giant and Bottom Dollar. They are used in Hispanic and Mexican cooking and add a lot of flavor and tartness to the soup. The wild turkey is native to North America and another turkey species is originally from Mexico. So turkey is a natural component in this stew. The Aztecs revered corn and liked to cook it with meat. 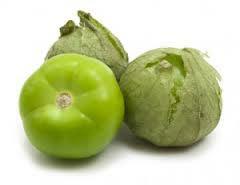 Tomatillos are native to Mexico, related to cape gooseberries. They are used in salsa verde and other Mexican dishes. So this compilation of turkey, corn, tomatillos and lime is a natural combination that will be easy to make and fun to eat. Go on, be adventurous and enjoy a steaming hot bowl of delicious posole and use up that turkey in a totally different way!